This is one for all those denizens of good taste out there. All those of you who would really, really like to take some classic weapons and bling them out until they sparkle. Go on - you know you want to! Golden AK47: Take a classic AK. Gold plate every visible piece of metal. Engrave the wood for good measure. Serious blingski. No tasteski. Dead cool, though. Golden Katana: Stunning craftsmanship, taking decades to perfect. And then someone just has to go and gold plate it... Pretty, ain't it? 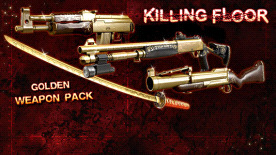 Golden M79: Gold plating. Gold filigree inlay on the woodwork. You probably want the rounds gold as well. Bosh! Consider it done! Combat Shotgun: Drench the metal in gold, polish until it shines and twinkles. Just the thing for the serious Zed-slayer.